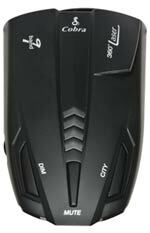 The Cobra ESD 7570 9- band radar/laser detector with UltraBright data display, has an ultra compact design with an improved range for high performance with refined style. The ESD 7570 features a digital signal strength meter to provide relative proximity to the target, city/highway selector to reduce the frequency of falsing in densely populated urban areas, LaserEye 360 degree detection, VG-2 undetectable/alert, Spectre1 undetectable/alert, Safety Alert warns driver of emergency vehicles and road hazards from system equipped with Safety Alert transmitters. This product is FCC Compliant. 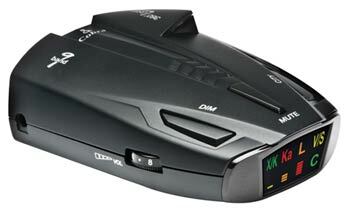 The ESD 7570 is an affordable radar/laser detector with reliable and proven performance. The unit detects all radar frequencies and laser signals currently used in United States and Canada, and comes with an UltraBright Data Display, City/Highway modes, and more. UltraBright display provides easy recognition of band detected by use of band identification icons. Quick and convenient access to most used features–mute, dim, city/highway switch. Warns drivers of the presence and/or approaching emergency vehicles, railroad crossing, and road hazard locations equipped with Cobra’s exclusive Safety Alert transmitters. Provides the user with relative proximity to the target. Safety Alert Warns driver of emergency vehicles and road hazards from systems equipped with Safety Alert transmitters. Tagged 9Band, Cobra, Degree, Detection, Detector, ESD7570, Performance, Radar/Laser. Bookmark the permalink.